THROAT EVO begins by neutralizing the effect of the original singer's vocal tract and then gives you the ability to specify the characteristics of the modeled vocal tract. THROAT EVO is a revolutionary vocal tool that lets you process a vocal through a meticulously crafted physical model of the human vocal tract, letting you literally design your own new vocal sound. Though designed to allow subtle modifications to a voice's quality, the range of controls also allows the creation of vocal tract models well beyond the limits of physical human anatomy, offering the possibility of vocal characteristics that are simply unattainable by any other means. For detailed control of the vocal sound, THROAT EVO's graphical Throat Shaping display allows you to individually adjust the position and width of five points in the vocal tract model, and the Breathiness controls let you add variable frequency noise to the model, resulting in a range of vocal effects from subtle breathiness, to raspiness, to a full whisper. Finally, THROAT EVO allows you to Pitch Shift a voice up or down as much as an octave to create a wide range of alternative vocal characters. 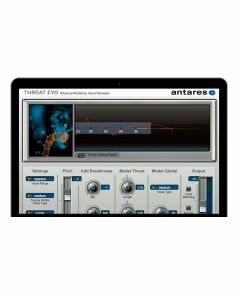 Whether to subtly enhance the quality of an existing voice, or to create dramatically unique vocal effects for post production uses, there is simply no other tool as powerful as THROAT EVO. THROAT EVO's controls allow you to modify the voice's glottal waveform as well as globally stretch, shorten, widen or constrict the modeled vocal tract. For even more detailed control, THROAT EVO's graphical Throat Shaping display allows you to individually adjust the position and width of five points in the vocal tract model, from the vocal chords, through the throat, mouth and out to the lips. THROAT EVO's Breathiness controls let you add variable frequency noise to the model, resulting in a range of vocal effects from subtle breathiness, to raspiness, to a full whisper. Finally, THROAT EVO allows you to shift the pitch of the voice up or down an octave to create a wide range of alternative vocal characters. Graphic Throat Shaping Display allows you to individually adjust the position and width of five points in the vocal tract model. Breathiness controls let you add variable frequency noise to the model, resulting in a range of vocal effects from subtle breathiness, to raspiness, to a full whisper. Pitch allows you to shift the pitch of the voice up or down an octave to create a wide range of alternative vocal characters. THROAT EVO requires an iLok (not included).